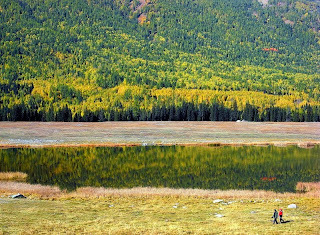 Luoping is a little countryside in eastern Yunnan situated about 228 KM north east of Kunming China. 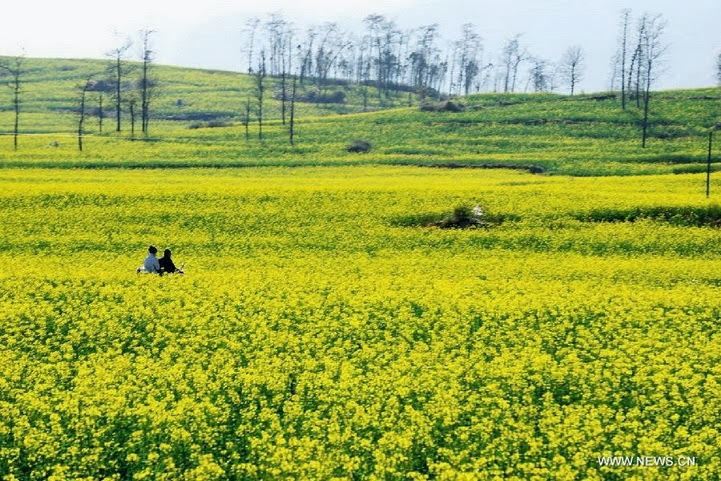 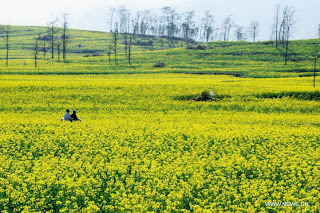 In the spring, Luoping turns into an ocean of flowers. 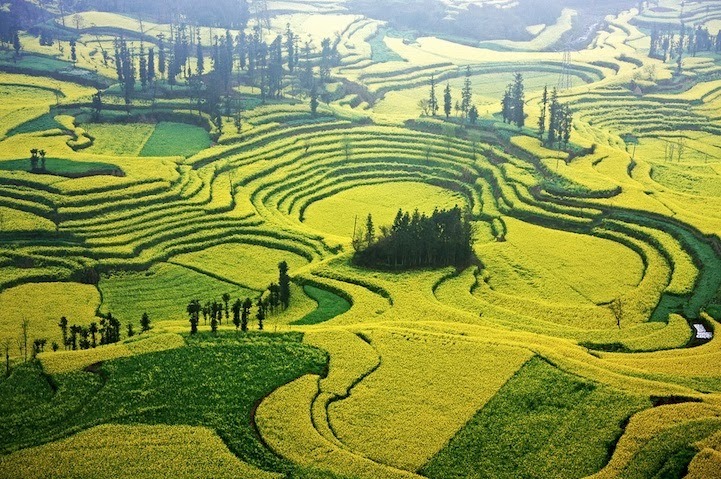 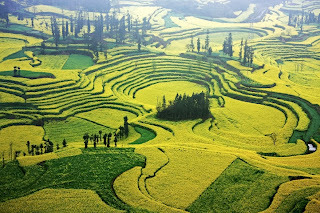 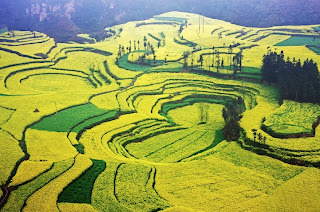 It is located close to the border of Yunnan with Guizhou and Guangxi provinces. 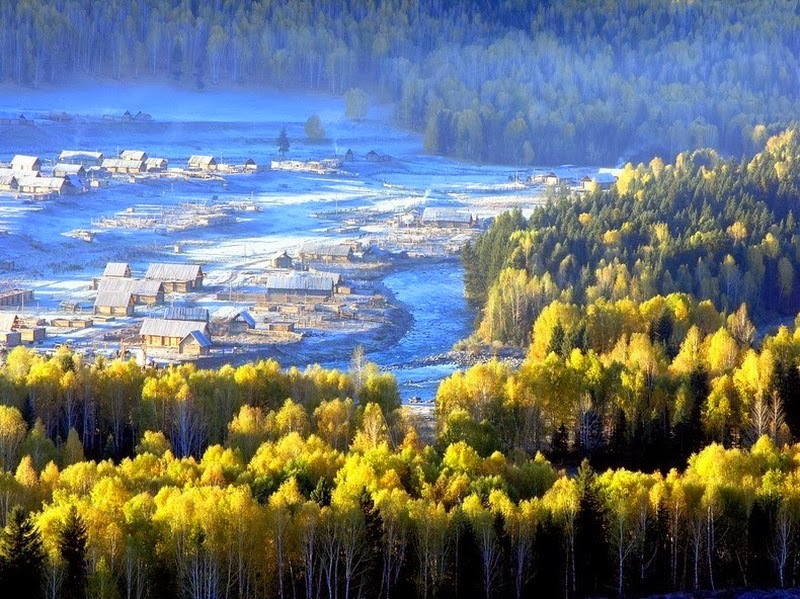 The town was frequently ignored by visitor passing through the region until recently. 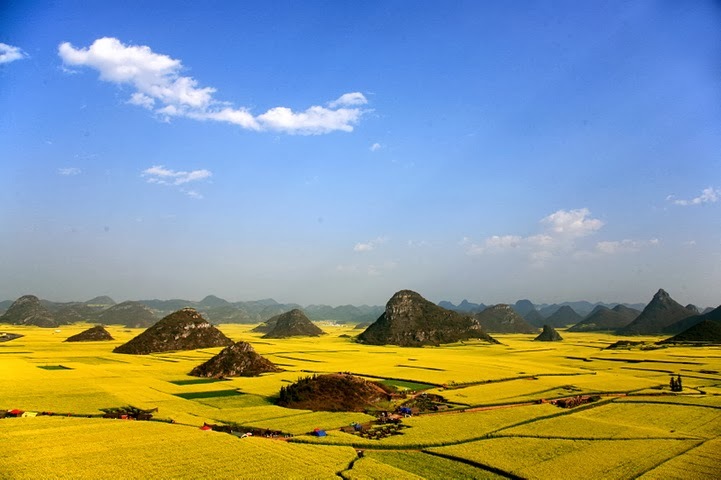 It had become a Mecca for photographers, who flock to this little county every early spring to capture the wonderful “sea of yellow” of blooming rapeseed flowers. The magnificent photos in turn, draw more and more tourists to this beautiful rural photographic haven. 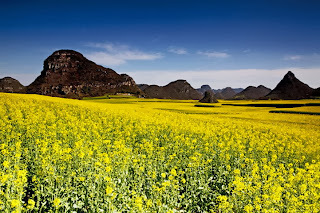 It's that time of the year that the rapeseed flowers or canola are in full bloom. 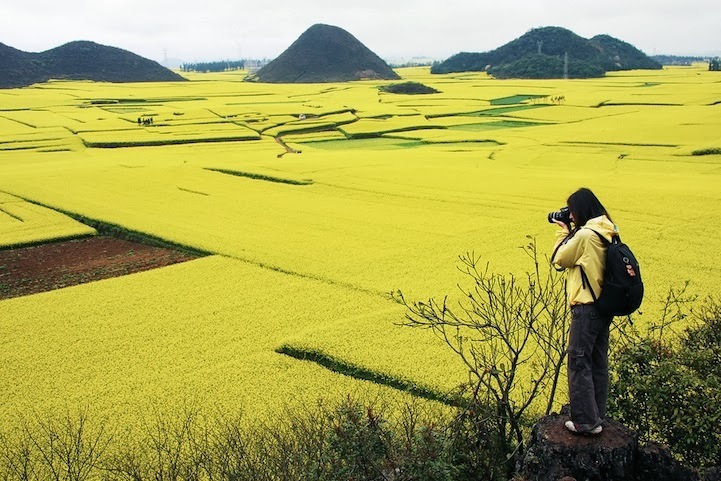 Photographers flock to this beautiful destination to capture the stunning sight rolling hills surrounded by bright yellow flowers as far as the eye can see. 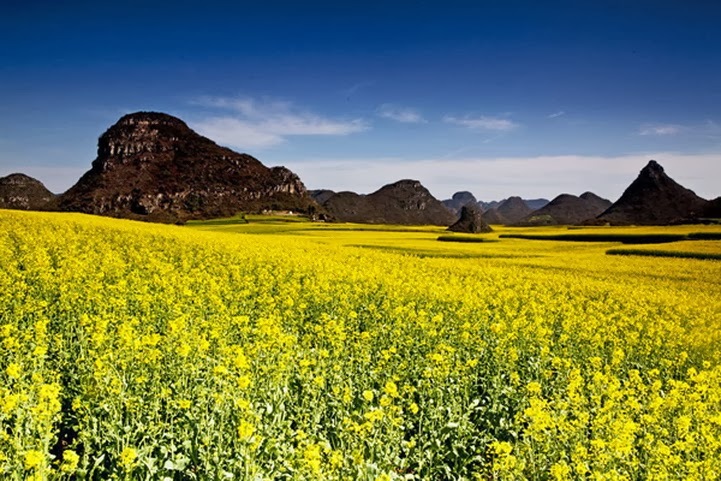 The blooming buds fill the air with the refreshing smell of spring that not only is a magnet for human, but also bees. 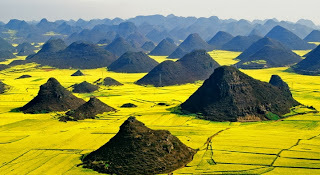 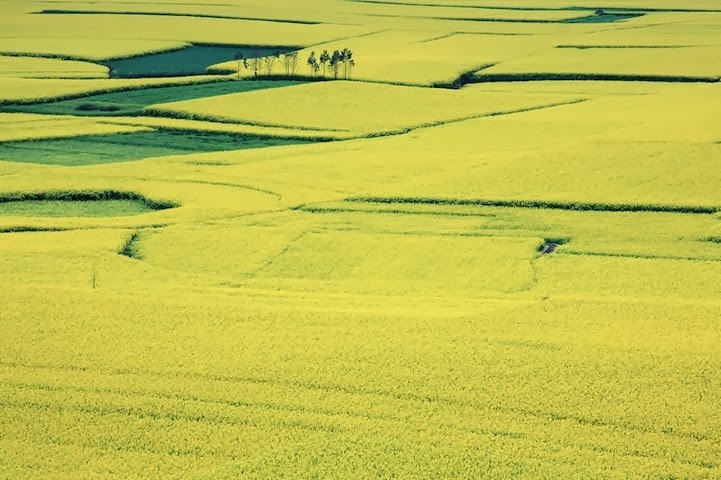 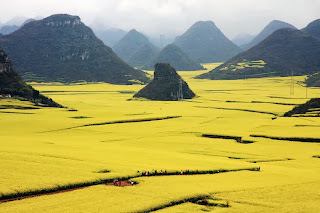 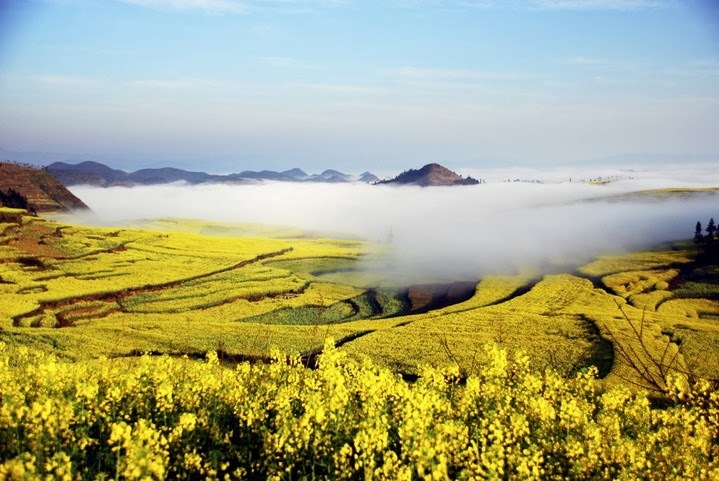 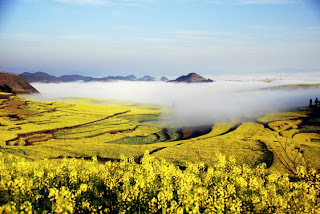 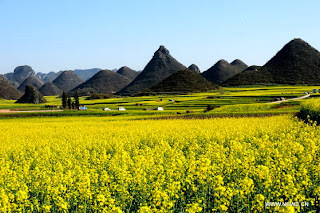 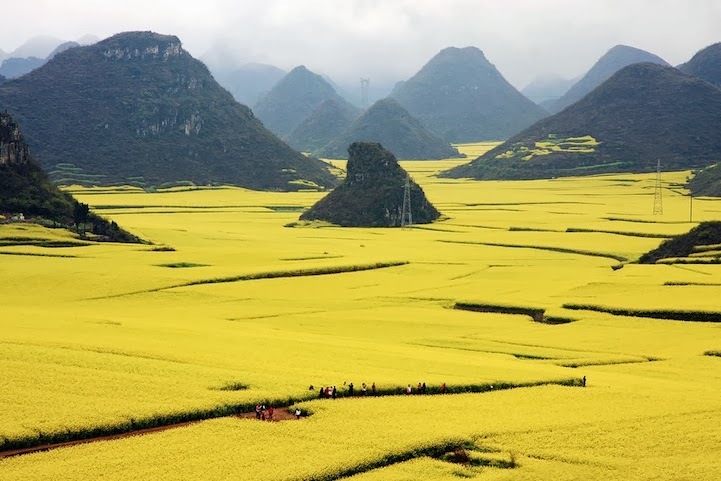 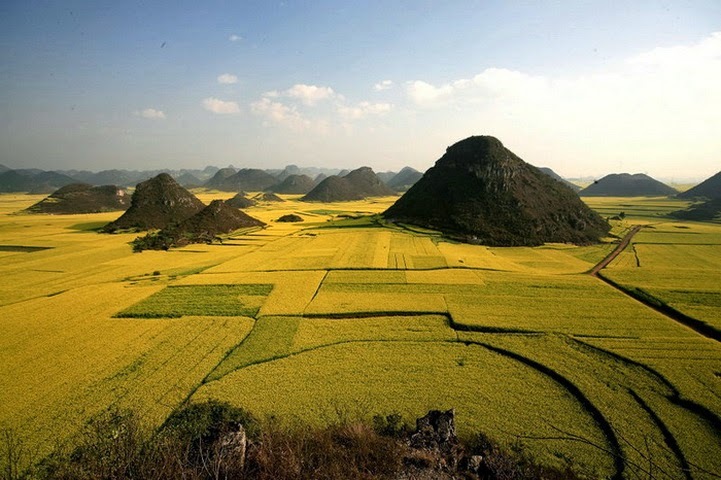 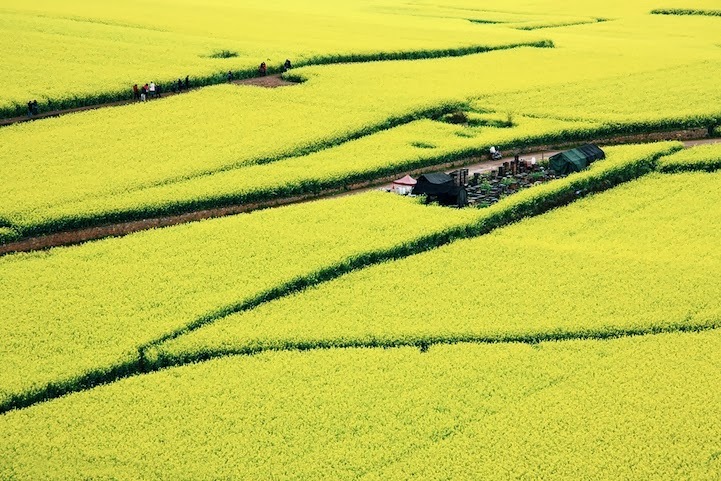 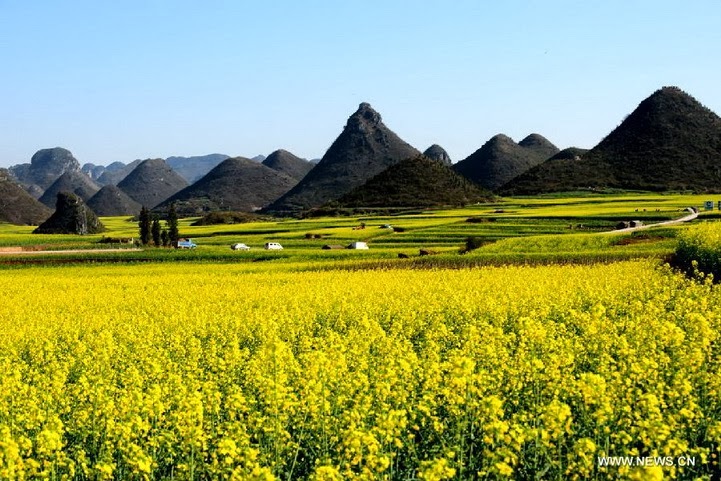 The attractiveness of the yellow sea of rapeseed flowers swaying in slow swirling waves in the gentle breeze is a sight that is out of this world. 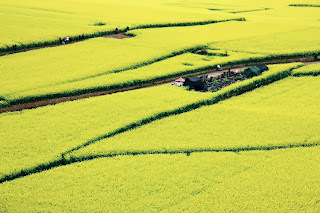 It is also the period for beekeeping and honey processing. 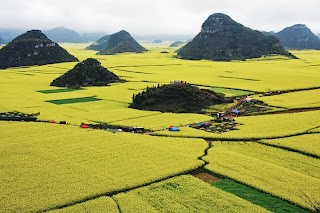 Beekeepers set up base in tents surrounded by the rapeseed farms every spring to keep bees and harvest their honey- the bees feed on the rapeseed flowers. Hence the majority rapeseed farms are also abuzz with bees in the spring and can be a small irritating. 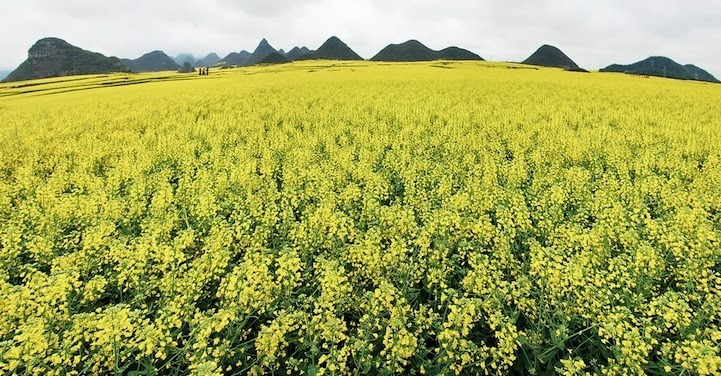 These beekeepers move on to other locations within Luoping after the rapeseed season, using wildflowers as feedstock for their bees. 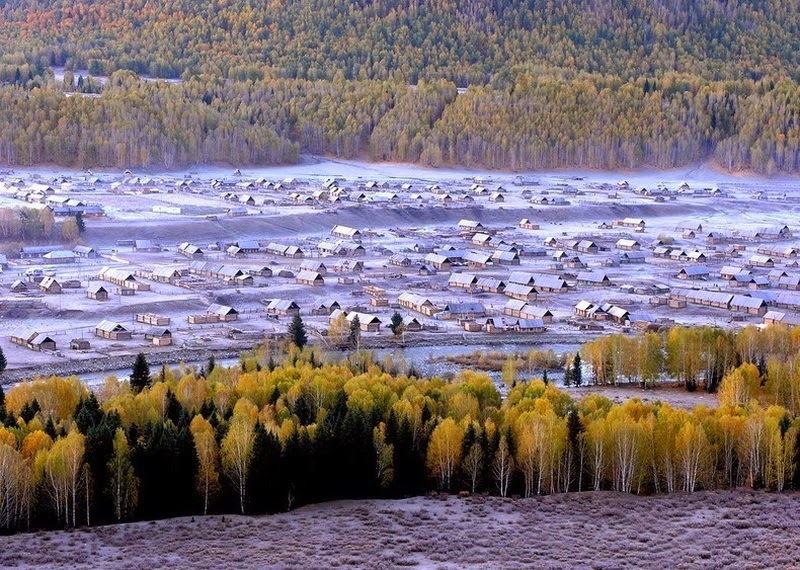 Kanas (Also called Hanas which is the name used by local Kazakhsare) is a nature reserve which means beautiful, rich and mysterious in Mongolian, could be most fascinating resort in Northern Xinjiang. 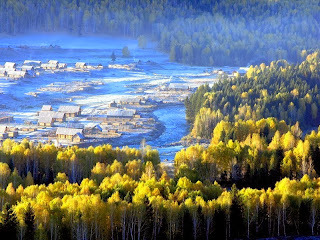 Kanas are located in the Altay Mountains of Northern Xinjiang in China. 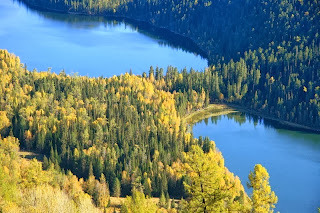 Travelers rave about the wonderful alpine scenery at R&R-perfect Kanas Lake, a long finger of a lake found in the southernmost reaches of the Siberian taiga ecosystem. 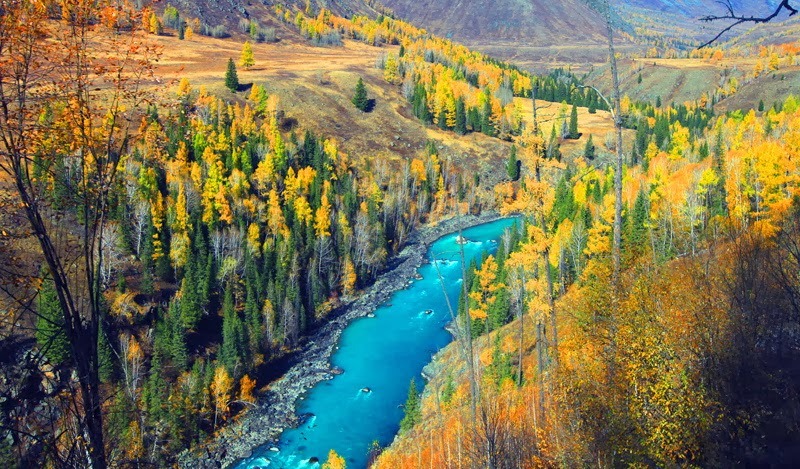 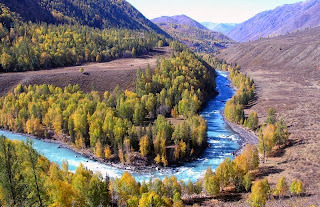 The Kanas nature reserve bounding is the only one in China to border three other nations - Russia, Mongolia and Kazakhstan. 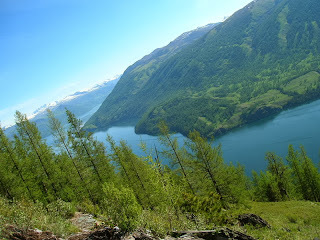 It is most popular natural ecosystem formed by lakes, glaciers, grasslands, forest, and rivers. 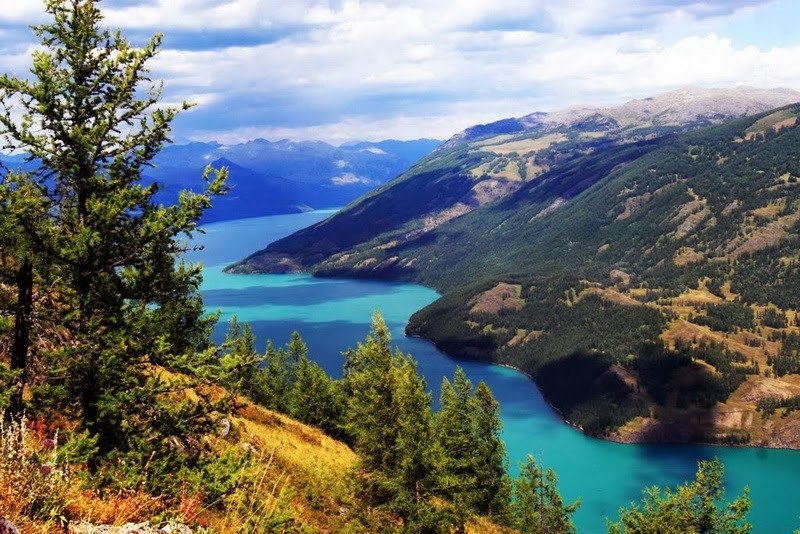 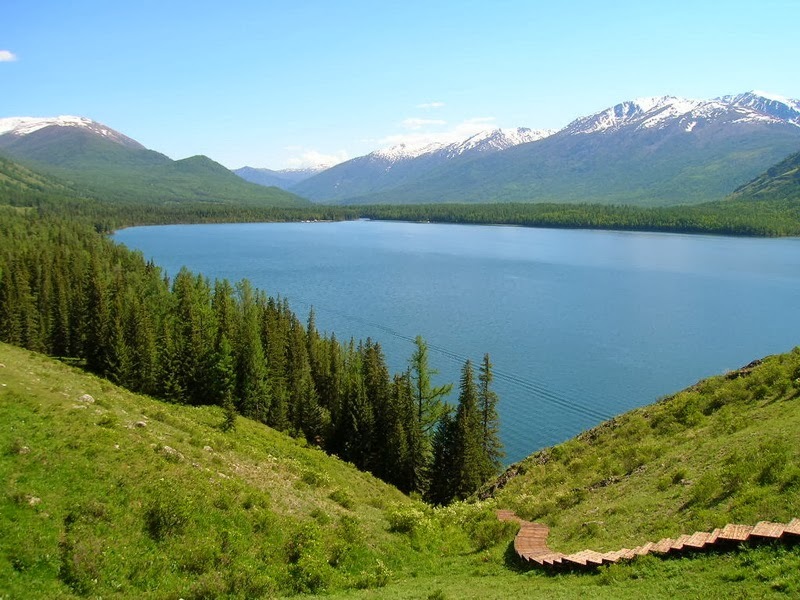 But the main highlight of nature reserve is Kanas Lake, located 1,375 meters above sea level, and covers an area of 45.73 square KM. Kanas Lake is 140 KM away from Burqin County, and 246 kilometers away from Altay City. 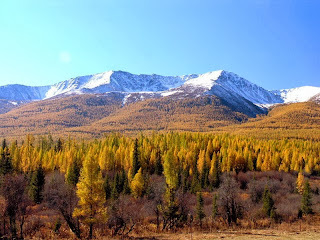 Well you can take a plane to Altay City or take a coach to Burqin County at Urumqi, and then rent a motorcar to get there. Moreover; there are free bus rides available after you buy the tickets of Kanas. 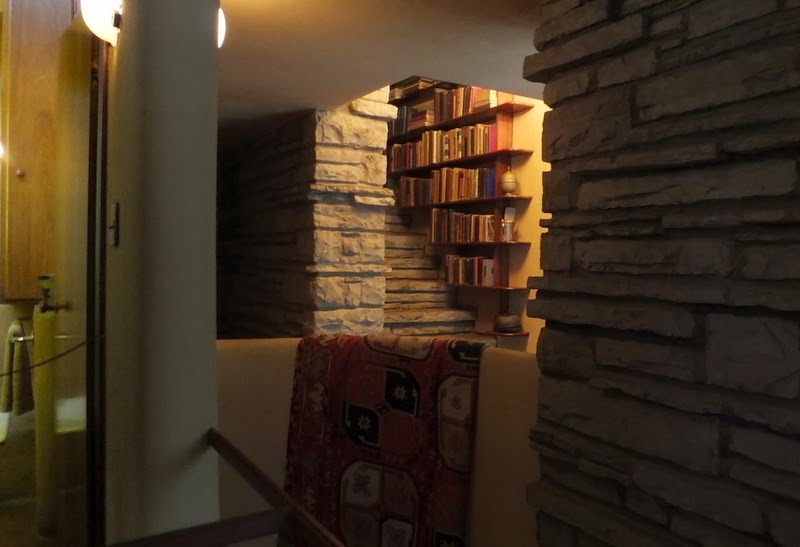 The service is quiet good and all the places are quiet well connected. 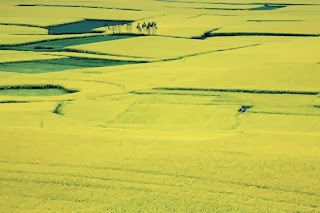 You can also ride horses with local guides. 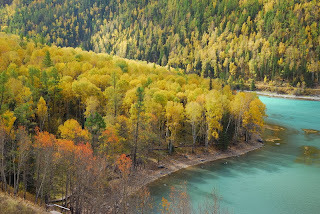 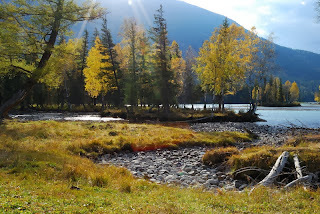 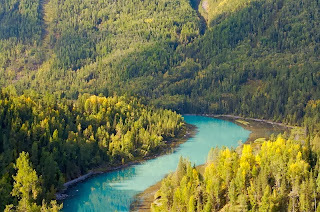 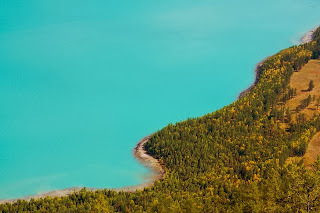 The attractiveness of Kanas Lake is more boosted by the changes in its color according to the season. During the thaw in May it is a deep grayish blue, which by June, when it reflects summers mountain greenery, has turned sky blue. The long bean-shaped lake provides rise to the Kanas River which flows out for about 125 kilometer across pristine, alpine forest before discharging into the Irtysh at Burqin Town. 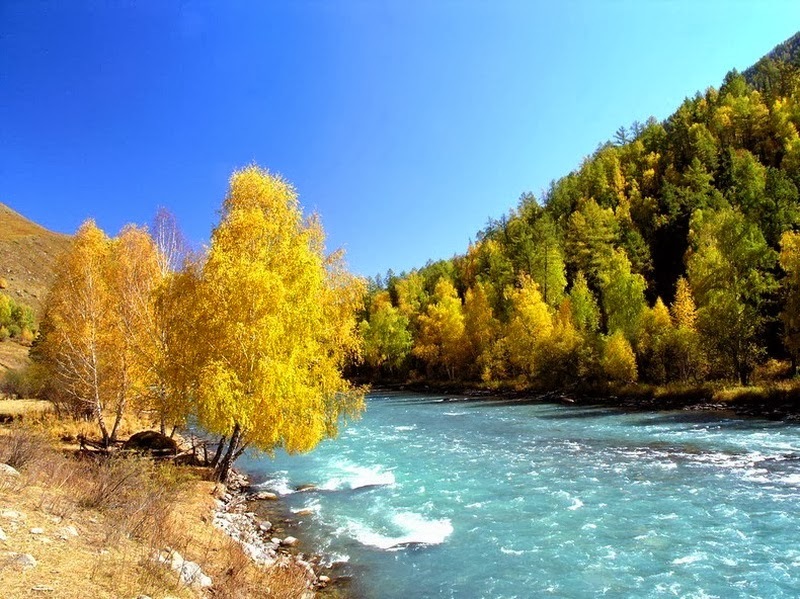 In autumn, the attractive landscape bursts into a riot of colors with gold, red, blue and green. 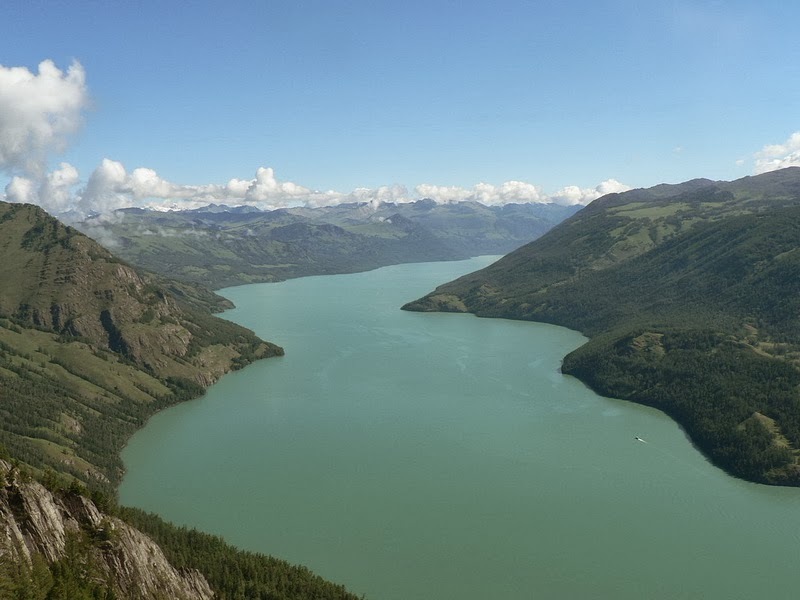 Many tourists to be here just to hoping for to catch a glimpse of the Kanas Lake Monster, a mythical beast that myriad tourists swore to have seen. 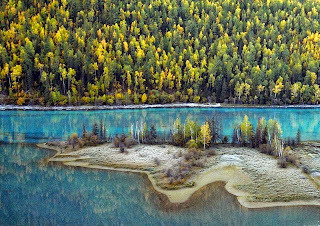 It’s same to Scotland’s Loch Ness Monster. After 1980’s the hype of stories sightings have regularly appeared in Chinese media. July is the flooding season, when deluges from the White Lake upriver bleach Lake Kanas milky white. 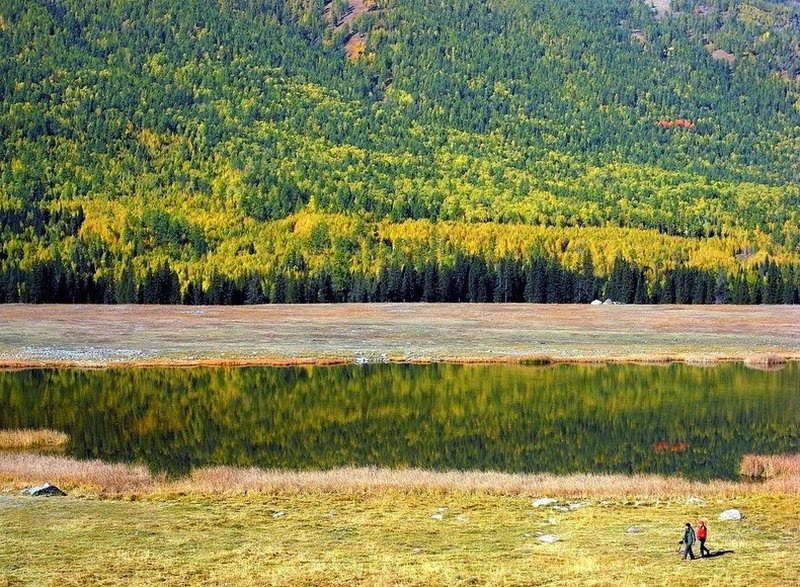 High rainfall in August deepens its color once more to an aqua green, which turns bright emerald in the drier months of September and October. 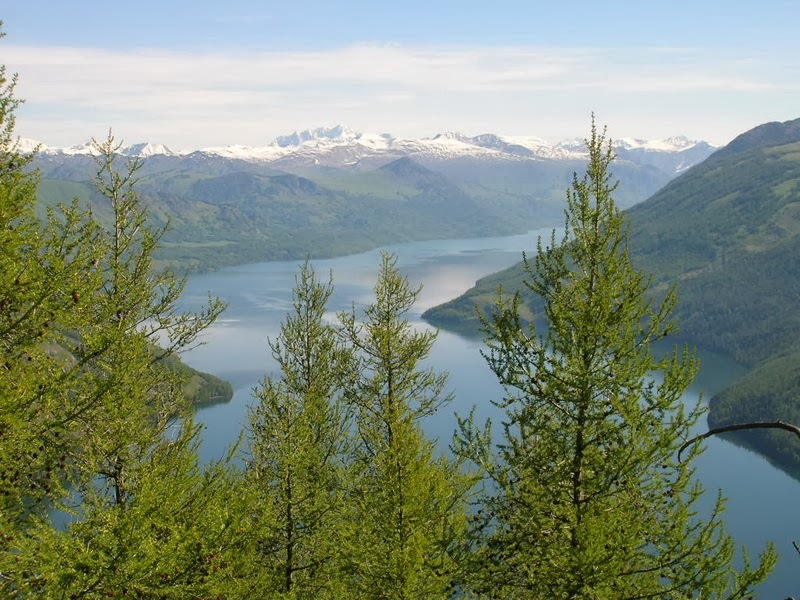 Amongst the numerous contributing features to this marvel are the various minerals that are carried downstream from the upper rivers, the varying colors of plant life on the mountains around the lake, and the varying angle of sunshine on the water surface throughout the year. 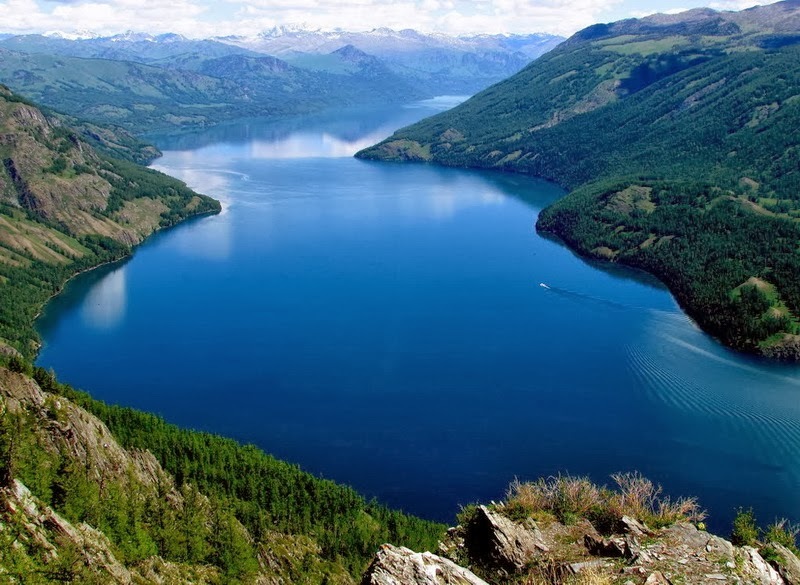 These stories attract more tourists and settlers came to this area bringing countless journalists and conspiracy hounds although researchers have dismissed the Chinese Nessie as a large member of the salmon family. Apart the temptation of monster, Kanas Lake is breathtaking place with its vivid, minty green water surrounded with forest and snow packed mountains. 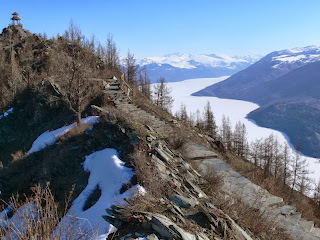 There is a 2000-meters long bank of dead trees on the one side of the lake, which have accumulated over the years, carried by strong wind and waves. The massive dike of dead trees is an uncommon spectacle. In winter it is extremely cold, so be sure to take proper protection, it abruptly becomes excessively cold during the night. The beautiful Kanas Lake is also home of thousand Mongolians, whose stout log houses are clustered into numerous villages. 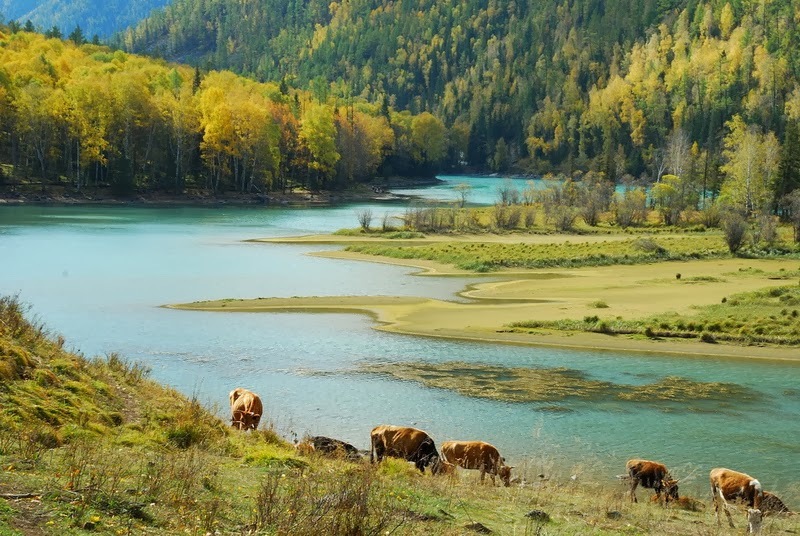 They quite habitual of eat fish from the lake, keep herds cows and sheep, and trade animal products for wheat grown in the south. 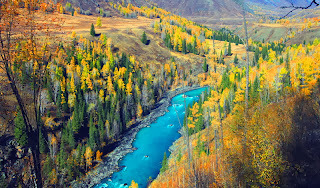 3 to 4days' trekking around the area is the perfectionist way to witness the beauty and an extraordinary experience practiced by all backpackers who travel to Kanas. 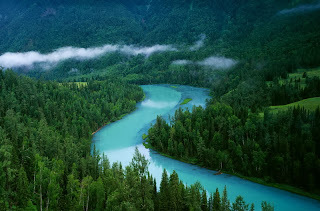 July is the flooding season, when deluges from the White Lake upriver bleach Lake Kanas milky white. 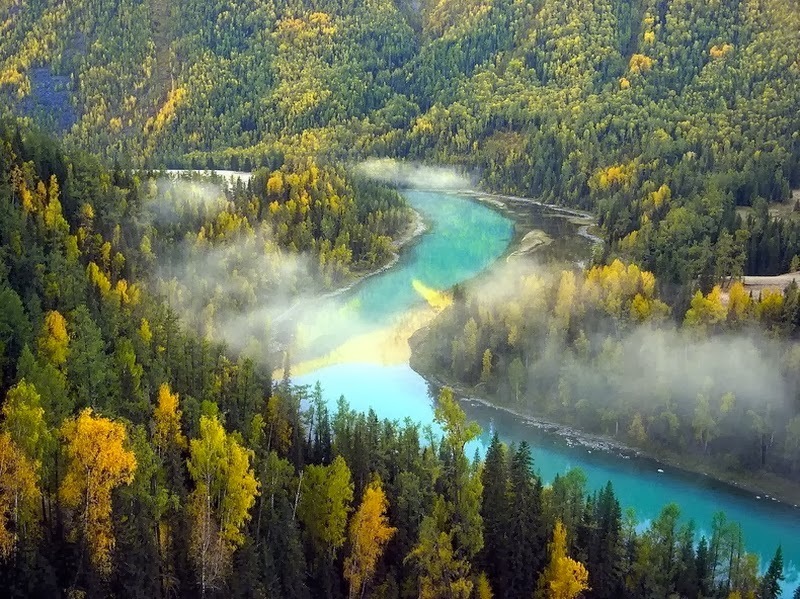 High rainfall in August deepens its color once more to an aqua green, which turns bright emerald in the drier months of September and October. Amongst the numerous contributing features to this marvel are the various minerals that are carried downstream from the upper rivers, the varying colors of plant life on the mountains around the lake, and the varying angle of sunshine on the water surface throughout the year. 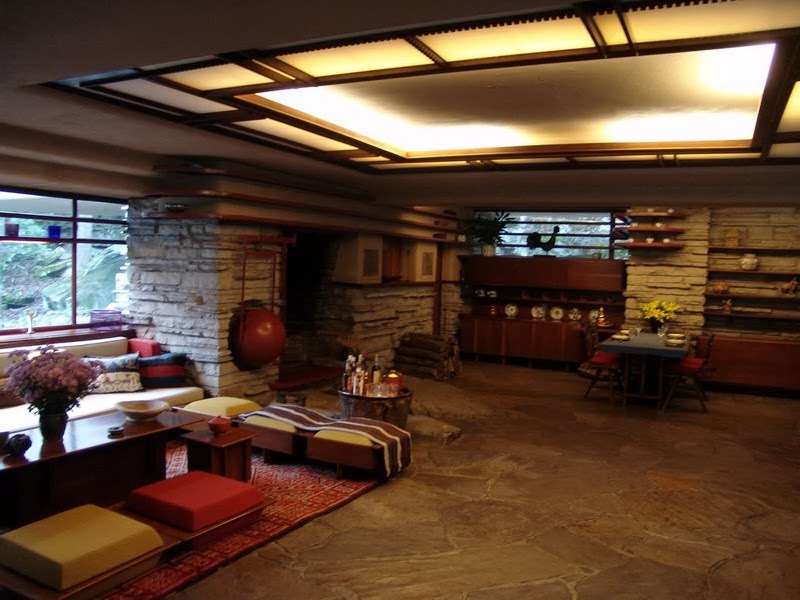 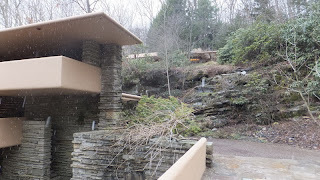 Fallingwater is famous as the Edgar J. Kaufmann Sr. Residence, is a beautiful house designed by American architect Frank Lloyd Wright in 1935 in rural southwestern Pennsylvania, 50 miles southeast of Pittsburgh, and is part of the Pittsburgh Metro Area. 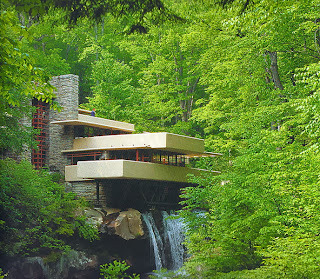 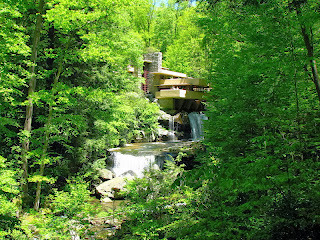 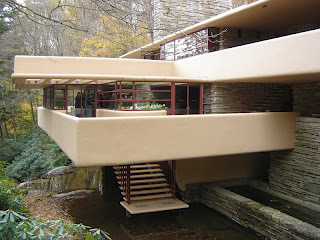 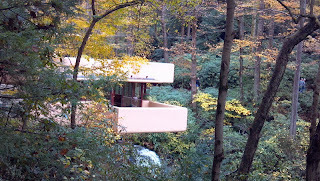 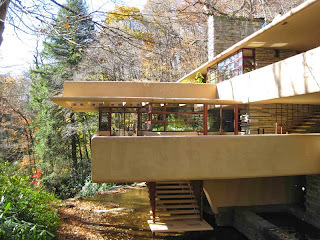 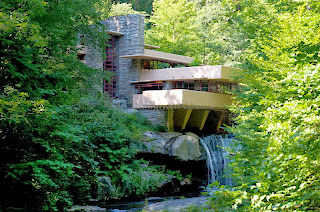 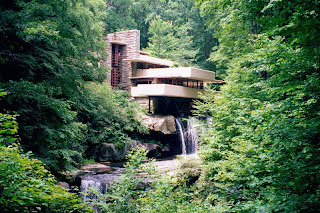 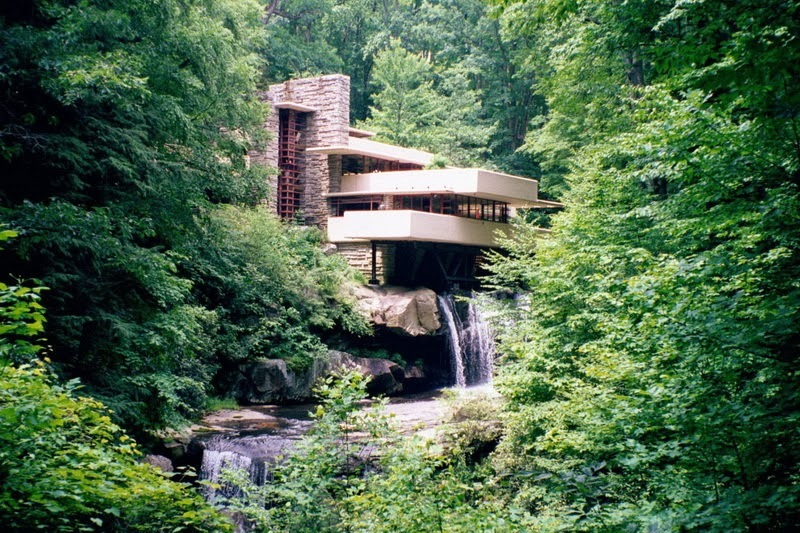 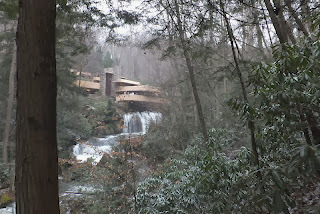 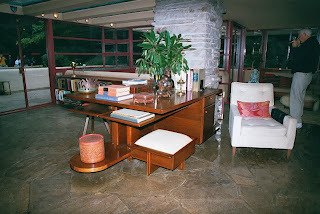 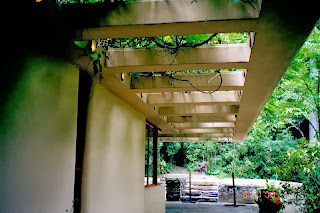 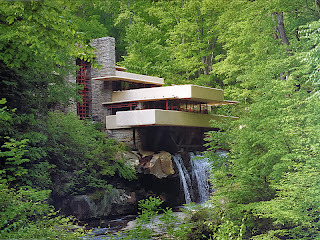 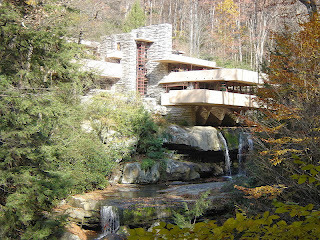 Fallingwater is situated in southwest Pennsylvania’s Laurel Highlands and 90 minutes from downtown Pittsburgh. 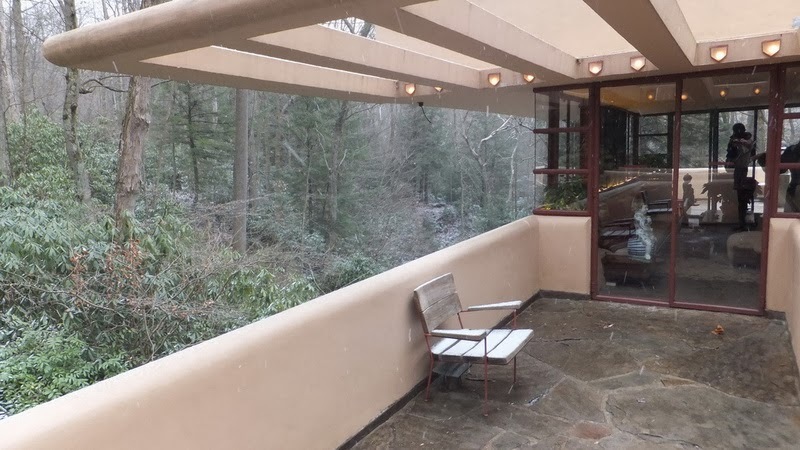 The home sits in a picturesque, wooded setting on PA Route 381 between the quaint villages of Mill Run and Ohiopyle. Amazingly the house was built partly over a waterfall in Bear Run at Rural Route 1 in the Mill Run section of Stewart Township Fayette Country, Pennsylvania, in the Laurel Highlands of the Allegheny Mountains. 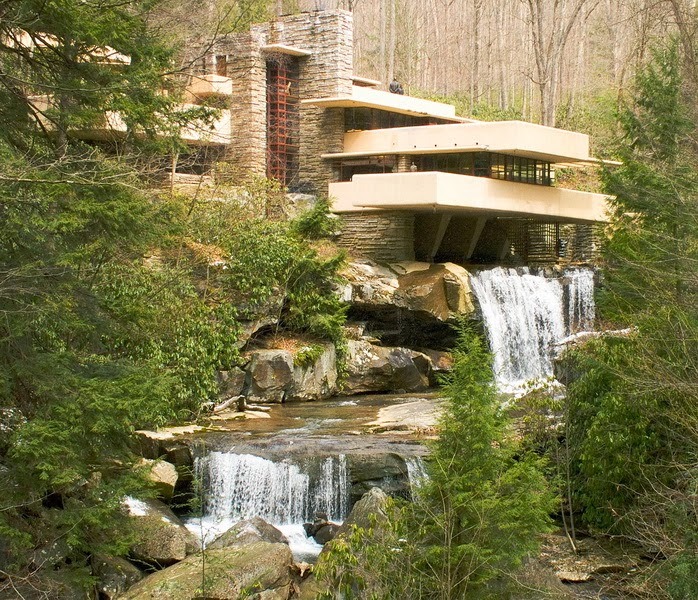 The house is hailed by Time magazine right after its completion, and listed among Smithsonian magazine’s life list of 28 places to visit before you die. It’s the most unique house and it needed people just as unique to make happen. 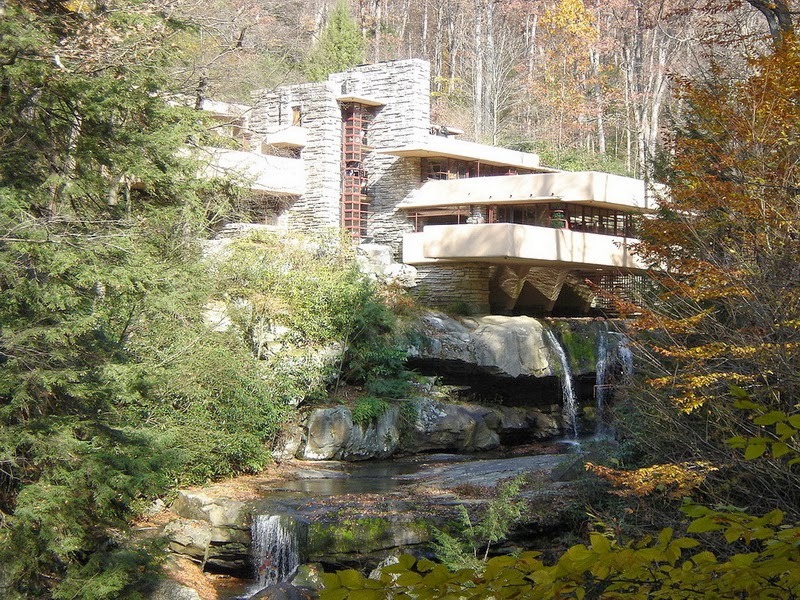 Fallingwater was built in between 1936 and 1939, and then it instantly became prominent place, and today it is a National Historic Landmark. 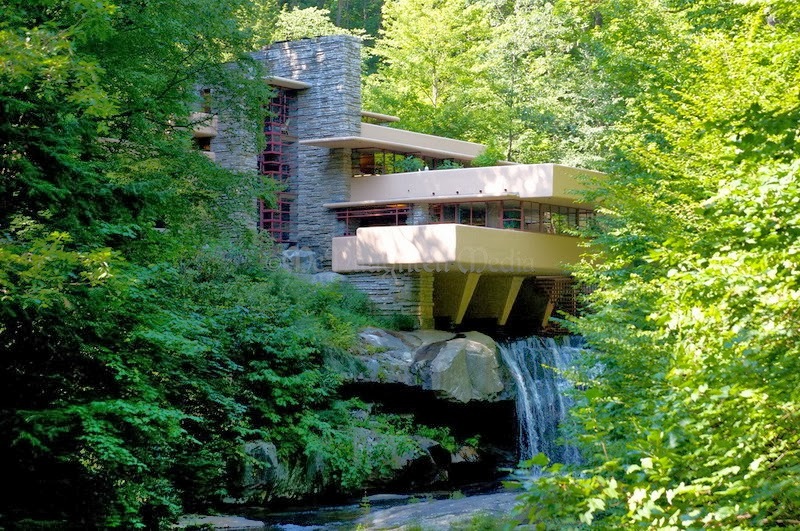 The actual reasons behind its popularity is; that house doesn’t even appear to stand on solid ground, but in its place stretches out over a 30’ waterfall, and it captured everyone’s imagination when it was on the cover of Time magazine in 1938. 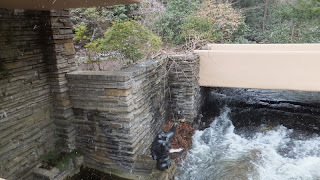 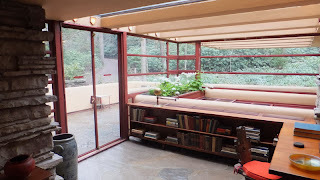 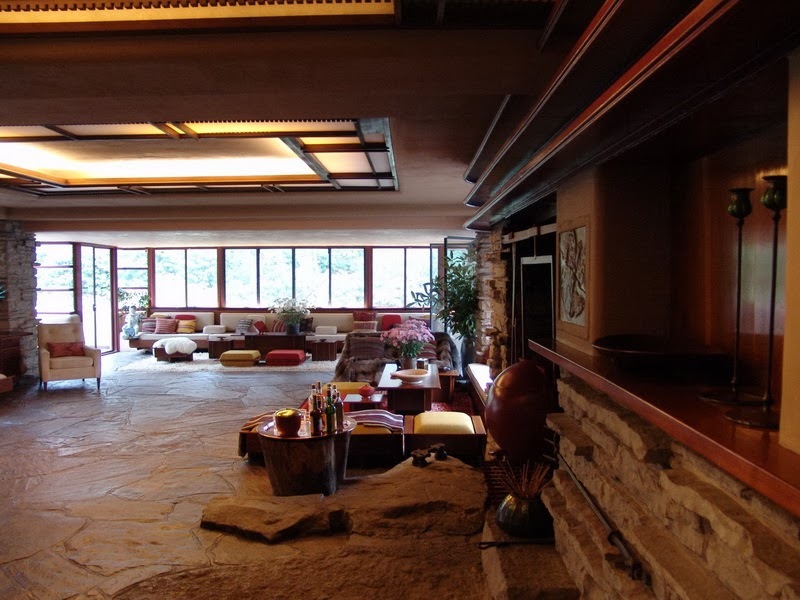 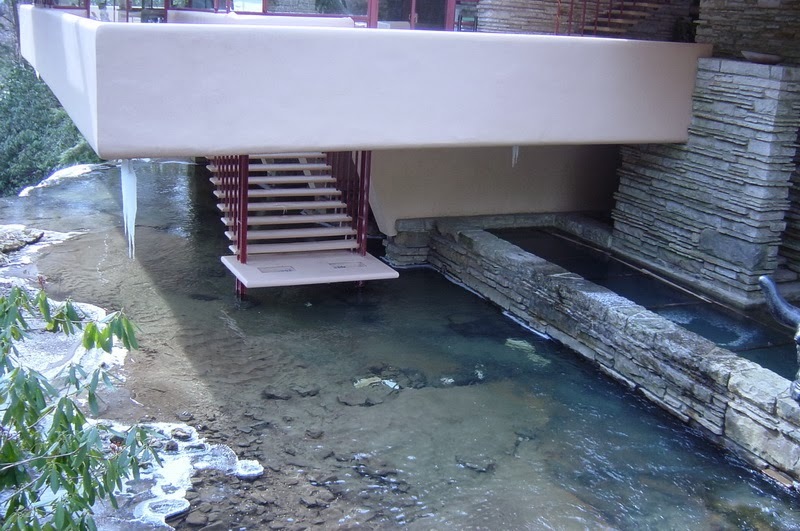 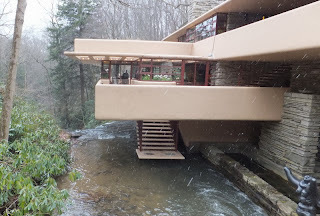 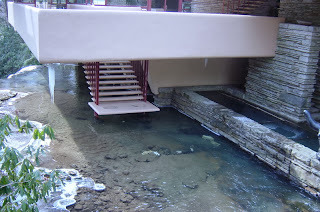 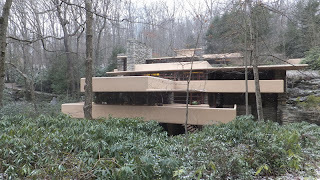 Because it is located in a rural area, so there is no public transportation to Fallingwater, visitors needs a car to travel here from your point of arrival. 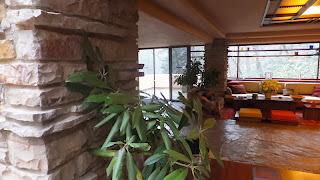 The final cost expense out on the house is $155,000 Including $8,000 architect’s fees, and $4,500 for installed walnut furnishings. 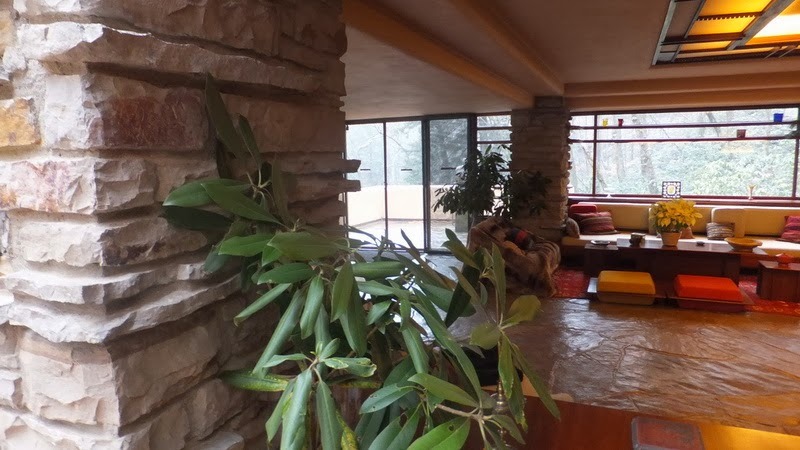 The main house covers 5,330 square feet while the guest house uses 1,700 square feet. 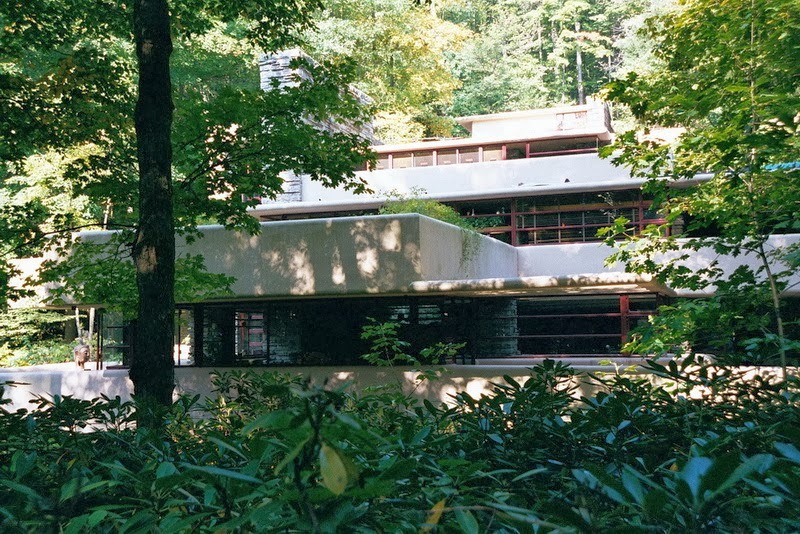 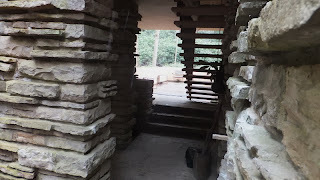 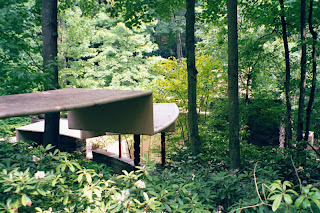 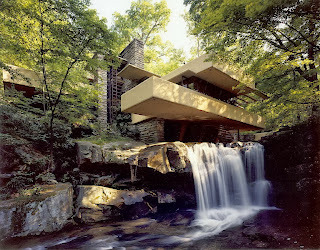 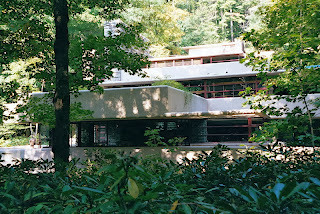 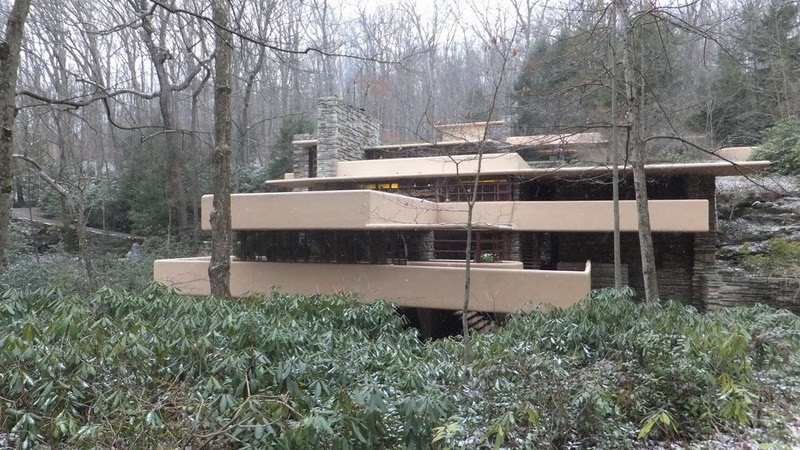 The Western Pennsylvania Conservancy conducted an concentrated program to preserve and restore the Fallingwater. 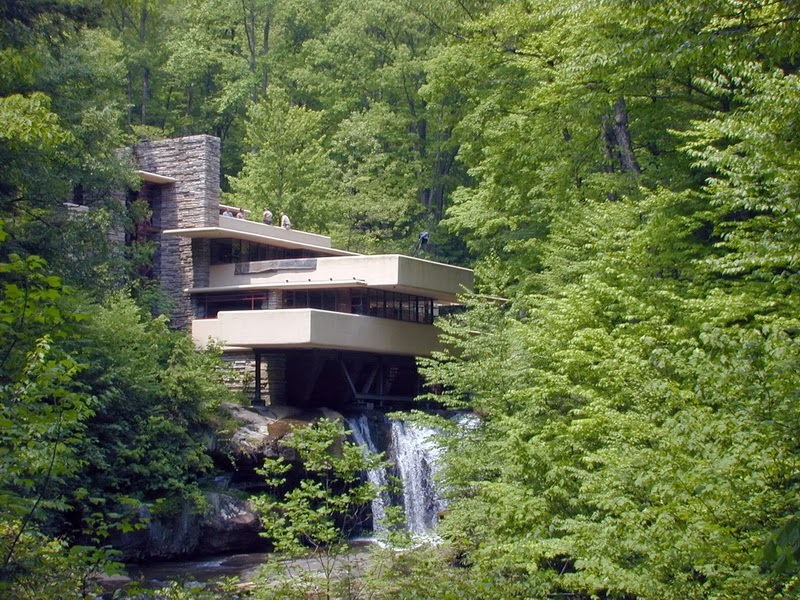 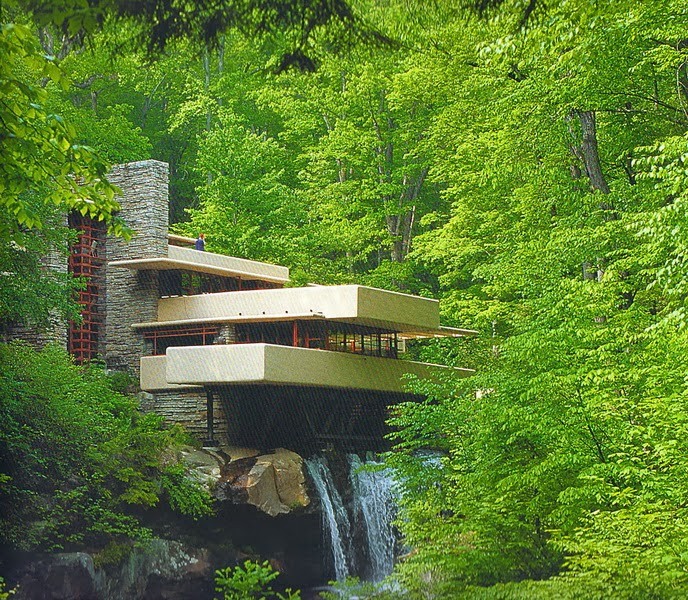 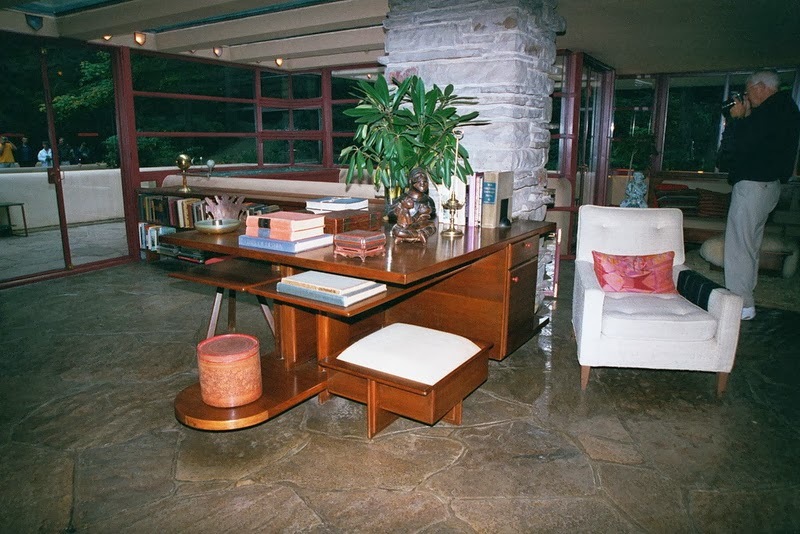 Since 1988, a New York City-based architecture and engineering firm was main responsible for the materials conservation of Fallingwater.